Last week I had the opportunity to do a blog swap on The Complete Savorist blog. Michelle shared her recipe and I shared mine on her site. If you did not have the opportunity to see that blog, here’s a peek at my offers and a bit about our blog swap! 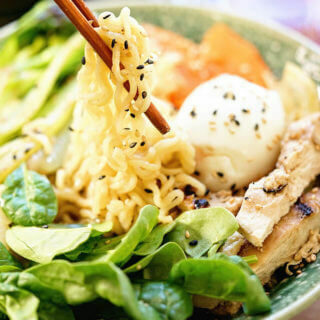 Michelle and I have been blogging about the same length of time and am so impressed by her creativity and flare for food! I’ve also enjoyed following her culinary journey as she has quite the story to tell! 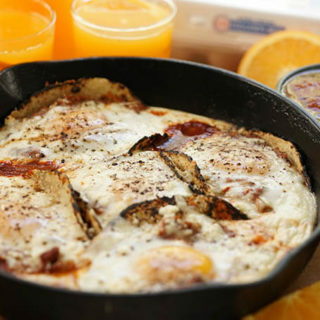 Michelle, thank you for the opportunity to share this recipe on your blog! 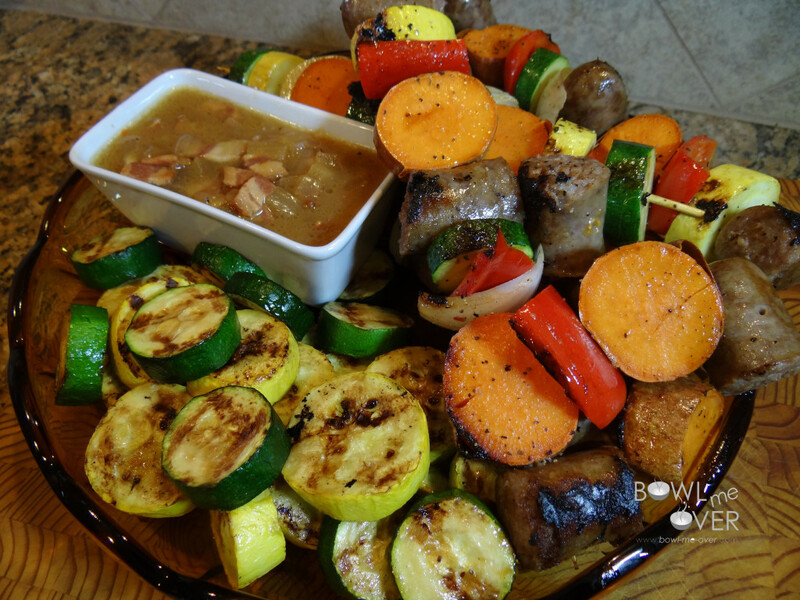 I got to thinking about what I’d like to make and after lots of thought decided upon Sausage & Veggie Kabobs with a Bacon Onion Sauce! Is that a mouthful? Well just wait until you try it! First you’ll start with a six pack of beer and by making some brats – now a long time ago I used to live in Wisconsin. I’ve done more than my share of tailgating and always enjoy a good brat! I cook them then and now the same way. You’ll start out by braising them in beer, onions and garlic. Pretty simple, one bottle of beer, a cup of water, one onion & and two cloves of garlic, allow to simmer on the stove – turn the brats occasionally and braise them for about 30-45 minutes until the brats are fully cooked. 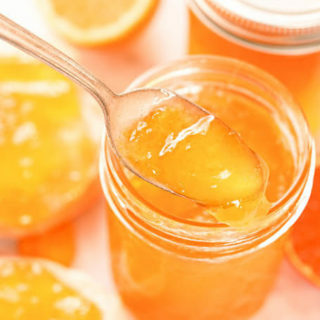 Remove from the heat, discard the liquid and allow them to cool. 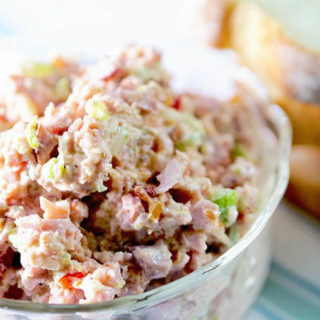 Now it’s time to make the sauce – for this you will take six slices of thick cut bacon. Chop them into lardons and place them in a 2 qt. sauce pan over medium heat to render out some of the fat. While the bacon is cooking, chop one onion & mince a clove of garlic. 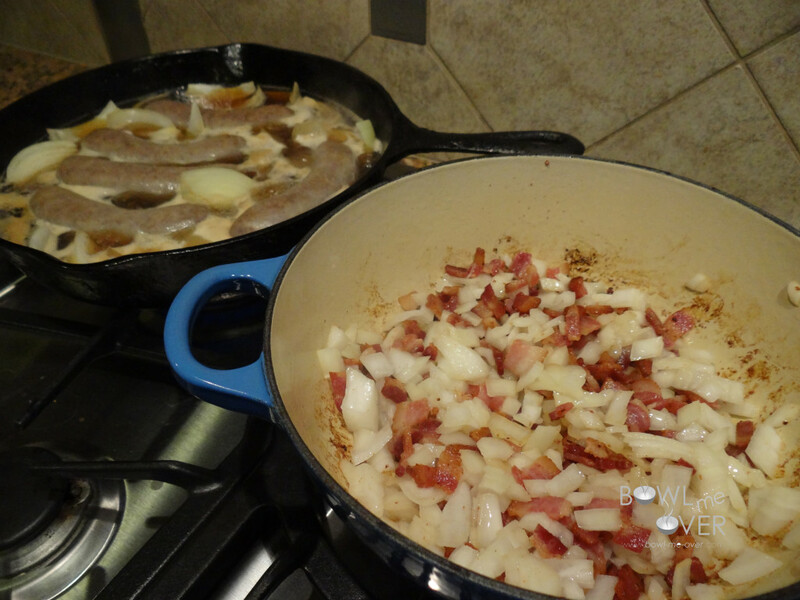 After the bacon has browned, drain off the fat and add the onion and garlic to the pot. Sauté the onions & garlic until they are soft, about five minutes then add in 12 oz. bottle of beer, 1 can of chicken broth and a few more things, sugar, apple cider vinegar, salt, pepper and red pepper flakes. Cook this over medium heat, keep it at a nice bubble – stirring occasionally, about 20 minutes. This will allow it to cook down and intensify the flavors. Oh! And since we’re talking flavors….this is absolutely amazing! The sauce is killer! 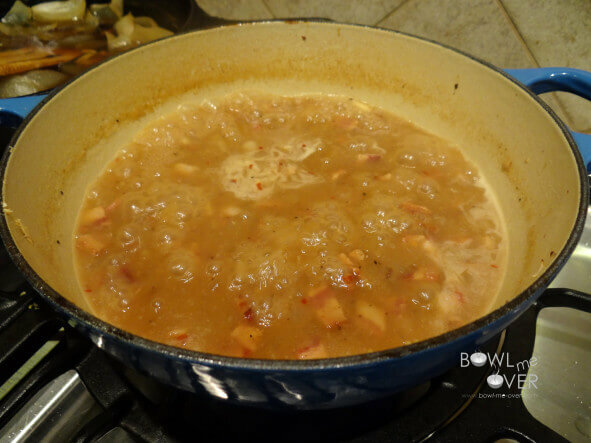 Sweet and sour with the bacon and onion….wow! At the end you’ll thicken it up with a bit of butter & flour. That’s it the sauce is done! Now it’s time to get grilling! Use whatever your favorite vegetables are – I would recommend trying yams – bake them in the oven first so they are fork tender (don’t overcook!) because the flavors mixed with the brats is sooo good! Or you can even use baby red potatoes. That’s quite delicious also! So, mix with your favorite veg – onions, zucchini, bell peppers, etc. 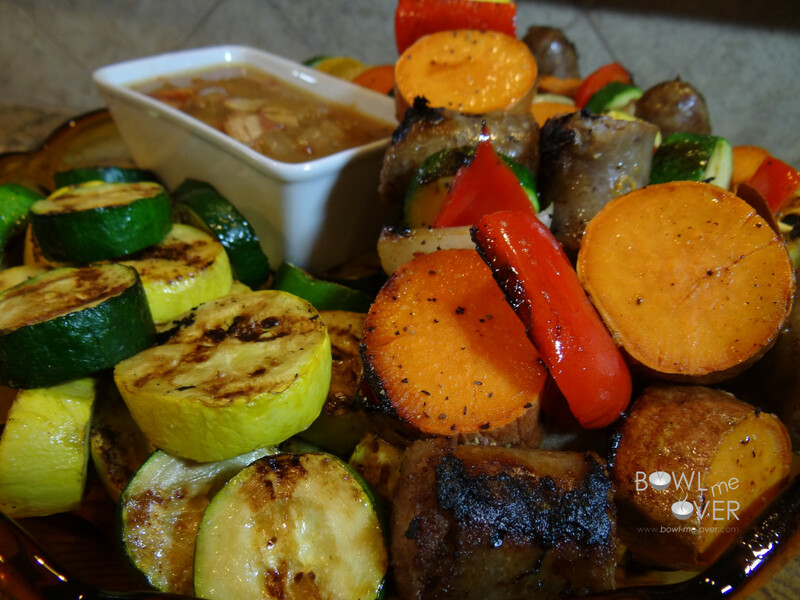 Skewer them and and get to grilling! Remove 1/2 cup of sauce and use it to baste the kabobs as you grill. Season them lightly with salt & pepper and that’s it – when you’re done grilling, dinner is ready! In addition to the kabobs I also grilled some yellow & green squash. This is a big ol’ platter of deliciousness here! There is enough sauce for everyone to have at least 1/2 cup each and this will make 6-8 kabobs depending upon the size of the kabobs you assemble. Grilling up extra veggies is always good to – because you can use them for soups or stews later if there are any leftovers! 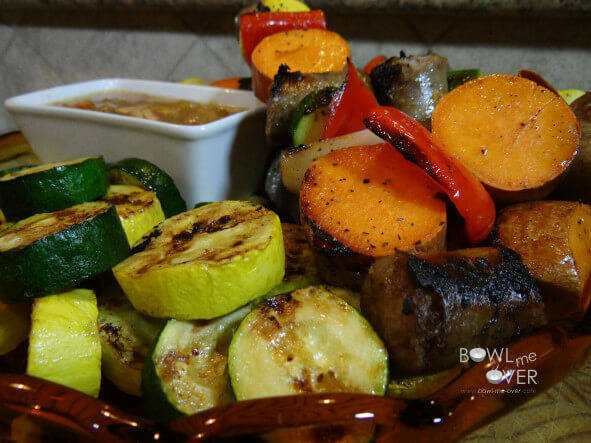 The sauce is so packed full of flavor and with the brats, veggies and potatoes it’s the most incredible combination! I hope you give this a try! 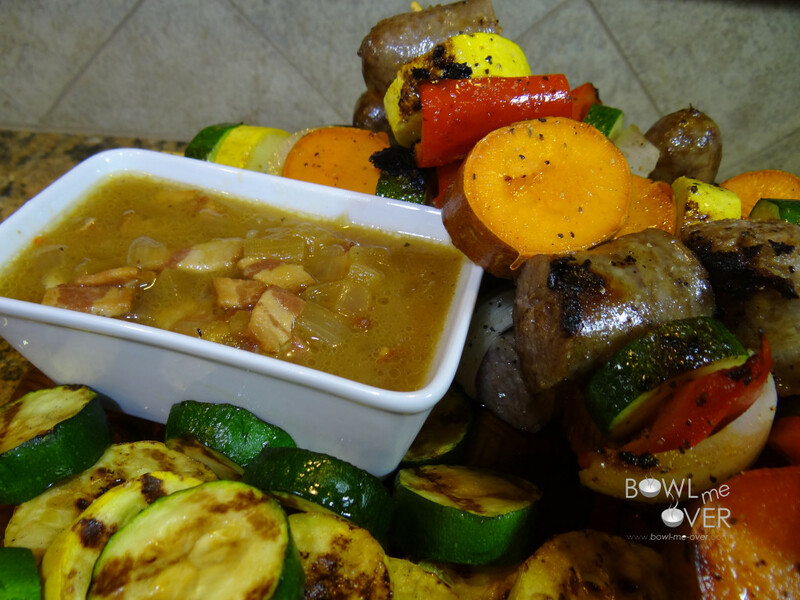 For the complete recipe for Sausage Kabobs with Bacon Onion Sauce please click here! They look so good. Will be making the very soon. We both love Kabobs. Yum!!! Awesome, let me know what you think, thanks Lois! We love kabobs! 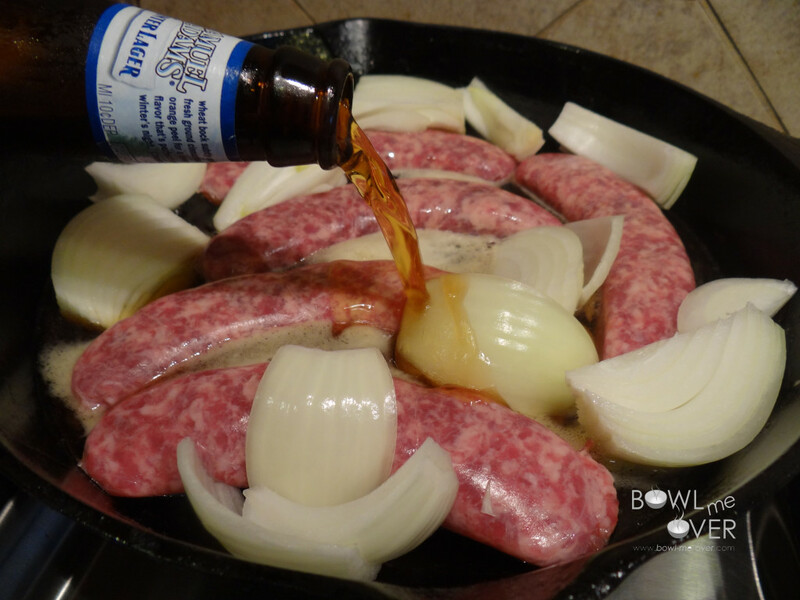 Never thought of using sausages and the bacon onion sauce will definitely be imbibed in! Thanks for another excellent recipe! You bet – always appreciate you stopping by Stephanie! Wow this looks good I love kebabs! Yum, yum, yum! 😀 I hope you enjoy them Lizzy! 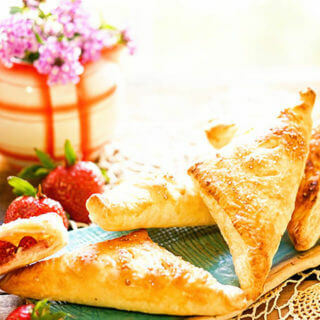 They look great, you have made me hungry now!! We love kabobs here! Thanks Tara – I agree, kabobs are always a fun meal! sounds great, just the kind of thing my husband would love. I’m pinning this to have in the summertime when I can grill it! G’day Looks very healthy indeed! Gotta love a big pile of grilled veggies, thanks Joanne! What a fun party dish! Love it! These look delicious, I love all the colors. I wish I had one for dinner! 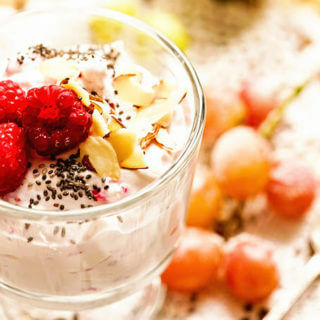 So good, you’ll definitely want to give these a try! 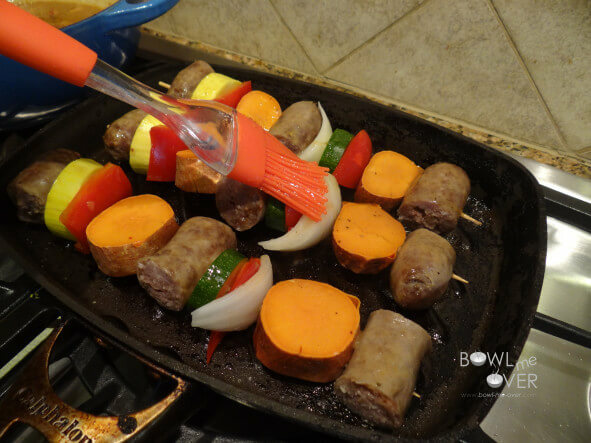 My clan loves kabobs as they are such a great finger food for the kids. Can’t wait to try these with the sauce. Awesome Brandy, give it a try and let me know what you think! This looks delicious!! Great combination of veggies, sausage and bacon.